Whilst the world of small-business and home computers was in a raging turmoil with hundreds of random machines coming and going, one thing remained a constant - the world of the terminal. Frankly, beyond the choice of colour of not, there's not a huge amount a terminal needs to do apart from communicate with the host system using whatever protocol is required. This protocol would be based on something like DEC's VT52 terminal, introduced in 1974, 1978's VT100 or the VT220, which was produced all the way up to 1987. Even today, most terminal applications (like xterm or Konsole) still use some sort of legacy terminal emulation (often VT220 or ANSI) to talk to a host. 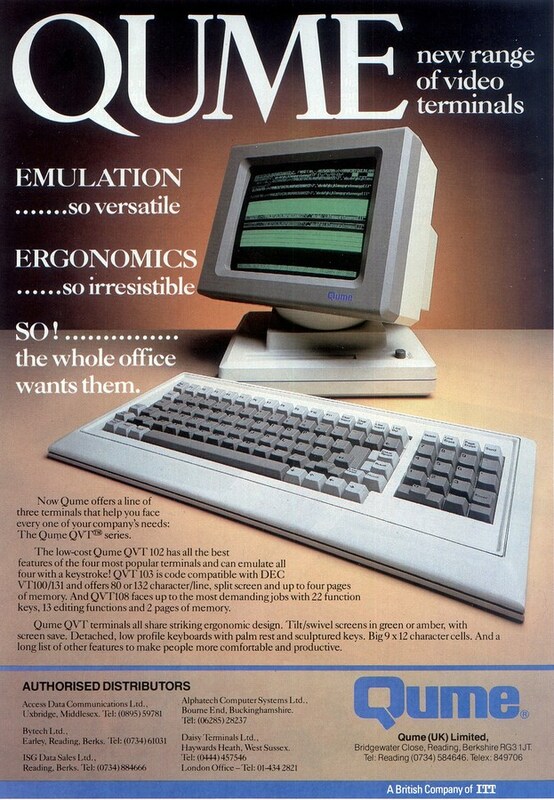 This advert is for the manufacturer Qume, who like Wyse, appeared to be in the market producing DEC-compatible terminals (although they were probably more famous for their Daisy-wheel printers). It is for a pair of terminals based on the VT100 protocol and makes much of the fact they have big 9x12 pixel characters and can remember "up to four pages". Oh, and they come in green or amber. As a footnote, the legacy of the terminal casts a long shadow on the computer market: attempts to produce more-capable "thin clients" in the late 90s and early 2000s, the increase in "virtualisation" and now the move to internet-based (so-called "cloud") applications are in many ways attempts to reduce the end-user hardware (PC, laptop, tablet, whatever) down to the function of a simple terminal - albeit one with better graphics and faster hardware, but still where nearly all the processing is done remotely. Just like a 1970s mainframe terminal.